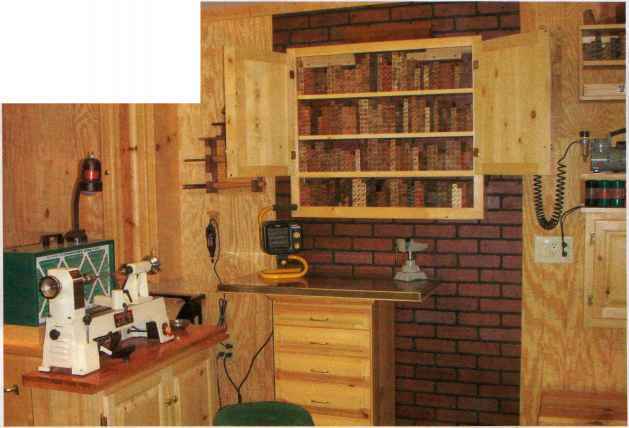 seven years ago, while scouring through my husband Jerry's woodworking magazines and catalogs, looking for a special Christmas gift for him. I came across a mini lathe that was advertised as the perfect tool for making custom pens... and I knew I was hooked. I envisioned myself sitting at a little student-sized workbench with my new mini lathe, diligently working away on tiny projects. 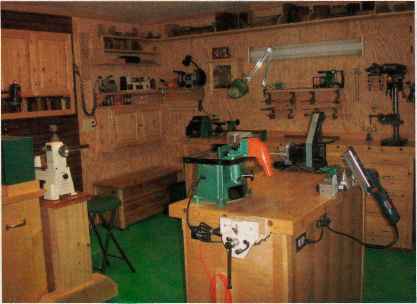 I ordered the lathe and lobbied Jerry for space in his basement workshop, assuring him that I would only need a teeny bit of room. 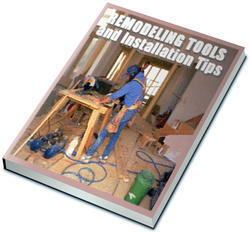 I had no woodworking experience, so I bought some books about turning pens. When my lathe arrived, Jerry showed me how to hold a gouge and a skew. My husband, Jerry, built the cabinets and helped me set up my 12'x 12'shop. All of my power tools are scaled for making pens and other small projects, such as fishing lures, wine bottle stoppers and game calls. I store all of my pen-turning blanks ¡n a special cabinet. The variety of colors and grain patterns is amazing^ and I love the symmetry of these little stacks of wood. Send us photos of your shop, a layout drawing and a description of what makes your shop interesting. Tell us what you make in it and what makes your shop important to you. If "My Shop"features your shop, you'll receive $ 100. 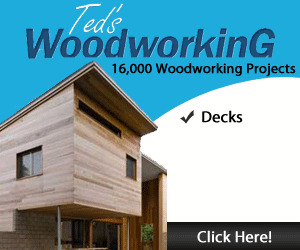 E-mail your entry to myshop®americanwoodworker.com with digital photos attached. Or mail your description with prints or digital photos on a disc to My Shop, American Woodworker, 1285 Corporate Center Drive, Suite 180,Eagan,MN 55121. Please include your phone number. Submissions cannot be returned and become our property on acceptance and payment. We may edit submissions and use them in all print and electronic media. my notion of adequate space changed. Jerry and I now share the basement, with my area having grown into a full-fledged 12' x 12' pen turning shop. It accommodates everything I need to make a pen—a large 8' workbench and four other smaller work surfaces, 24 drawers and 18 cabinets. Jerry custom-built them all for me—a great reward for all those years of woodworking-oriented Christmas presents! The workbenches, shelves and cabinets support the scaled-down tools of my"five inch"turning trade: three mini lathes, a mini drill press, a mini disk sander, a mini shaper (for the pen boxes), a mini air filter, a mini metal cut-off saw (for the brass tubes), a mini duplicator, mini air compressors and a mini vacuum. Following my theme of small-scale tools, I cut my pen blanks to length with a fine-cut power handsaw, instead of a using a miter saw. In fact, the only full-size tools in my area are my turning tools. In addition to pens, I now make a host of other five inch projects, including letter openers, wine bottle stoppers, fishing lures and game calls.These small projects don't throw a lot of sawdust around, so my shop is easy to keep clean and neat. I store my respirators, face protection, project hardware, bits, calipers, rulers, files, glues, gloves, and sanding and finishing supplies inside cabinets and drawers, where they stay dust free and easily accessible. My projects don't require a lot of material (I can get up to 12 blanks out of a small piece of turning stock), so storage space isn't an issue. I've accumulated over a hundred differ ent local and exotic hardwood turning blanks. I study books and articles about their origins and the legends that surround some of them, and wherever Jerry and I go, I watch for anecdotes about how they have been or are being used. I write that information on cards that accompany my pens. I get teased about the 144 square feet of space that I "need" to make a pen, but sharing woodworking with Jerry is one of the high points of our 40 years together. WHEN I INTRODUCE someone to woodturning, I choose the spindle roughing gouge. When I work with kids, it's the first tool I place in their hands. Why? Because, used correctly, the spindle roughing gouge is one of the safest, most user-friendly turning tools. And don't be fooled by its name.The spindle roughing gouge can leave a very smooth surface. Master this tool, and you'll learn basic techniques that apply to using virtually all cutting-type turning tools. However, the spindle roughing gouge must be shaped and sharpened correctly and used in the appropriate applications—or its friendliness can quickly disappear. A spindle roughing gouge is designed to quickly shape square wooden blanks that are mounted on the lathe with the grain running parallel to the bed. Borrowed from, and primarily made in England, this tool is deeply fluted (curved), and its cutting edge is straight (Photo 1). In the U.S., most turning sets come with a completely different roughing tool—a large, shallow gouge with a domed or fingernail shape. This tool looks a bit like a spindle detail gouge on steroids. Users of "American" style roughing gouges are usually instructed not to attempt removing a blank's square corners on the lathe; instead, they're directed to saw off the corners before mounting the blank. Spindle roughing gouges are available in several sizes. My advice is to buy the largest size, as it simplifies a leveling cutting action (Photo 2).The spindle roughing gouge is not the best choice for detail work or for making quick turns. And don't even think of using it to rough out a bowl or vessel blank (Photo 3). Its large surface area makes it awkward to maneuver in a confined space, its long straight edges leave exposed sides and corners that will easily catch, and its tang is not strong enough to engage the cutting edge far beyond the tool rest. 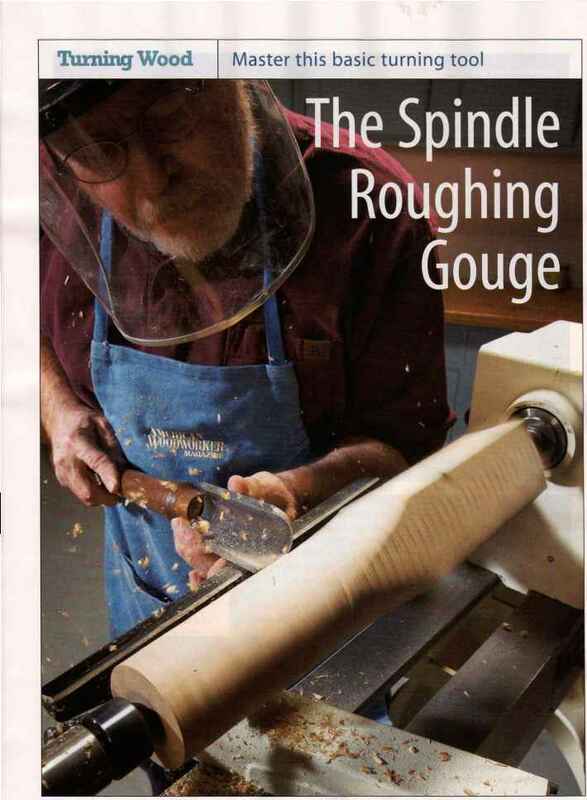 Using a spindle roughing gouge for bowl turning is dangerous; use a bowl gouge instead. The spindle roughing gouge is a great choice for creating cylinders of any size (Photo 4). And it's the best tool for removing the corners on any square stock measuring up to 5" x 5". It's much faster and safer than tilting the tablesaw blade and running the stock through numerous times.The spindle roughing gouge easily creates straight tapers, and it can also produce shapes that are slightly convex or concave. But don't ask this tool to detail or turn quickly—it simply does not perform these tasks with a lot of control.